and execute a clear path from current to optimal state. What We Provide For You ? Consulting Projects – short-term engagements with a defined set of deliverables within a budget. Recurring Roles – part-time position with defined responsibilities and budget. Right from the start, there was a level of trust and investment in our company vision that was unique for an advising group. They have supported and grown our finance team, helped evaluate our supply chain and empowered us with tools and insight to drive our company’s value. They bring experience and strategic insight, while truly listening to what is needed. Even better is that they are so enjoyable to work with! 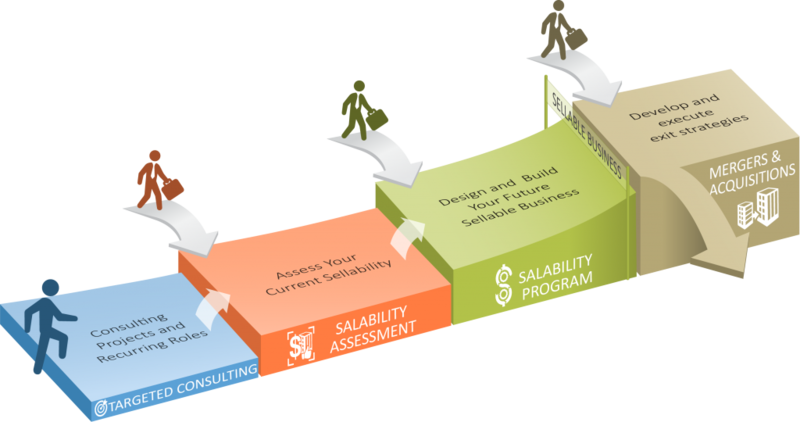 A comprehensive assessment of the salability, and value of your business today, and its greater potential over the near term. ​And they take care of their customer, which is an increasingly rare find. Through the ClearPath Salability Program, clients have experienced a value increase of 4.2x over the course of the relationship. ASB partnered with ClearPath to create a plan to have a sale transaction as an end game. We started one year before the transaction. ClearPath was instrumental in helping create a plan to sell the company and guiding us on the steps needed before we engaged with a buyer to maximize value for ASB owners. Chris then created and drove the plan towards a sale. Once we had an Offer, he coordinated the process of the sale between the accountants, attorneys, and owners. A tremendous value. Chris and the ClearPath team took the lead on the entire sale process and helped deliver a successful close. This transaction would not have been as smooth without the guidance and council of ClearPath. Chris, you are a brilliant negotiator and I could not have done this without you. You were a coach in our corner and a true advocate. Having never sold an Ag business before, the speed in which you learned about our business model, identified the right prospects, along with your personal touch, gave me confidence. Your poise under pressure was impressive. Our Support Team is standing by. Fill out our free analysis to see how sellable your company is.